StarTech.com Thunderbolt 3 USB-C to Thunderbolt Adapter - Windows and Mac - Thunderbolt adapterUse first-generation Thunderbolt and Thunderbolt 2 devices with your new Thunderbolt 3 computer. 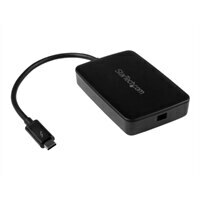 With this adapter, you can connect Windows and Mac based Thunderbolt 3 computers to older Thunderbolt devices, such as external hard drives, Thunderbolt displays, and older Thunderbolt capable Mac computers. Your computer's Thunderbolt 3 ports might not function properly until you update one or more of the following on your computer: BIOS, Thunderbolt firmware, Thunderbolt 3 controller drivers, Thunderbolt 3 software.